After nearly two years of continuous renovation, the Harbour House has been reborn. Over more than hundred years, untold thousands have ventured to our shores and traveled through our doors as they discovered the enchantment of Salt Spring. As we look ahead, we also consider our history. Of a guesthouse established in 1916 by Nona Crofton, her farmer husband Fred taken away to serve in the First World War, leaving behind six young children to care for (including a newborn). Of Billy Eng, who served as cook for more than fifty years. Of clay tennis courts and saltwater swimming pools (both the height of vogue in their day, now long-since retired from service). Of a community hub, a source of respite and relaxation and joy for generations of visitors and locals alike. And now we look forward to extending this spirit for generations to come, in our banquet hall (the Crofton Room, as it continues to be known), our restaurant and outdoor patios, guest rooms, suites, and spa. It was said that Mrs. Crofton’s warmth and liveliness was at the heart of the Harbour House, bringing guests back year after year. It’s our wish to do right by her legacy, here on the site of her and Fred’s original guesthouse, where they made a home for their guests for more than thirty years. A beacon at the head of Ganges Harbour, turning weary travelers into avid explorers, customers to guests and friends. If you plan to host your special event on Salt Spring, we are happy to share information about our facilities for meetings, conferences and weddings, available for up to 160 guests. Early in the 1900s, newlyweds Alfred Fred Crofton and Nona Wilson bought Jack Scovell’s 100-acre seafront farm at the head of Ganges Harbour. They set about raising livestock, fruit, vegetables and their quickly growing family of “D’s”-- Dermott, Desmond, Diana, Doreen, Denise, Donovan and Dulcie. When Fred went off to fight in the First World War, Nona began taking in overnight travelers and eventually renovated their farmhouse into a 12-bedroom guesthouse, named it after Fred’s Irish country home and opened the doors of the Harbour House Hotel. Guests came by land and sea to sample the Crofton’s rustic yet elegant hospitality. There eventually came to be a saltwater swimming pool, twin tennis courts, picnics, fishing trips, scavenger hunts and high tea served on the vine-covered veranda. Meanwhile, the original farm supplied Billy Eng, the hotel’s chef for nearly 50 years, with produce, eggs, turkeys, hams and chicken to feed the Crofton family as well as the hotel guests. 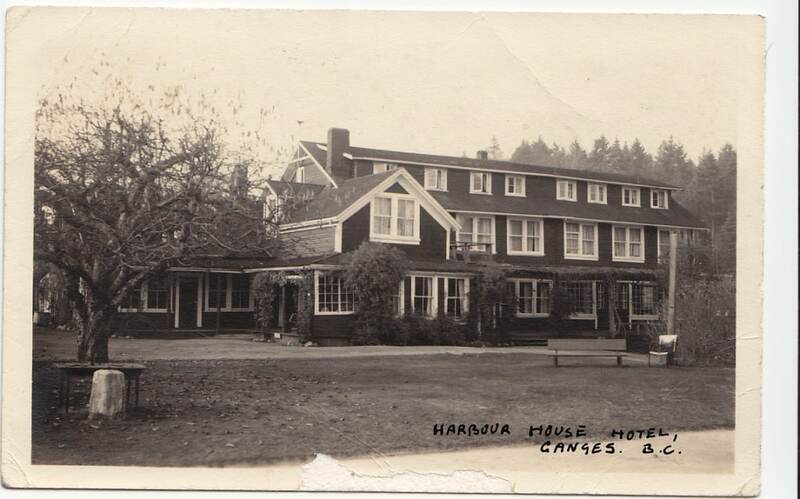 There was no refrigeration and no regular ferry service, so the Harbour House Hotel, and Salt Spring Island, was largely self-sufficient. After the Crofton’s sold the hotel and regular ferry service in the mid 1950’s brought meat and produce from afar, the farm fell into disuse. Much of the land was sold off and developed, donated, or given to the Crofton children. The last 17 acres remained behind the hotel and grew up with alders, blackberries, wild rose, broom and thistles.